I’ve had this post on my to-do list for months. To be honest, this is the piece of this whole process that I have the most questions about, so I just kept putting off writing it. I’m in a book group with some colleagues for some PD this year, and we’re reading Linda B. Nilson’s Creating self-regulated learners. I hope this will help me, but I need to articulate my questions before I read, so I’m intending to use this post to do that. That’s the thing about blog writing–it can be tentative, exploratory, uncertain. I can write to learn here and maybe it will help you think through some things too. And maybe you’ll read my thoughts and leave a comment that helps me. 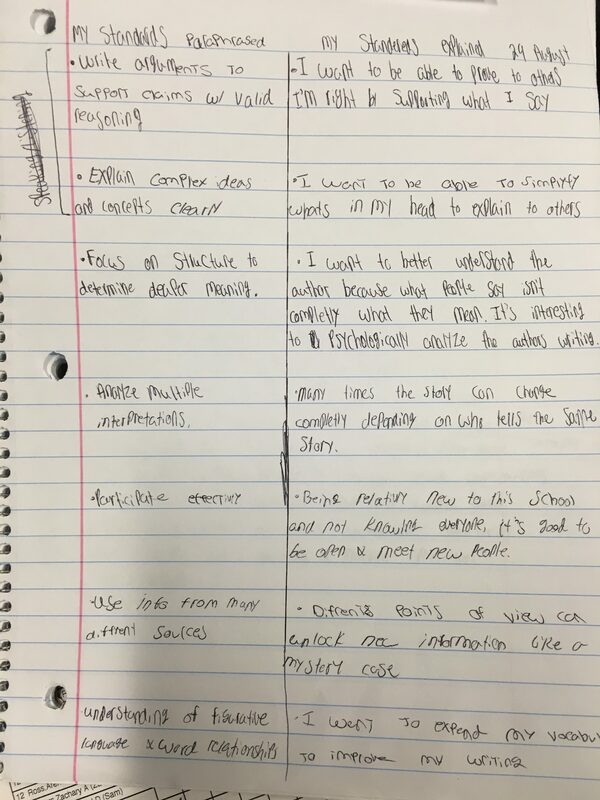 In September, I had them make pages in their writer’s notebooks with their own personal learning goals. Students chose goals for themselves from the Common Core State Standards (we are in a Common Core state). The task was to select at least seven standards (two writing, two reading, one speaking/listening, one language, one research) and paraphrase them into their own words and then write why they wanted to work on those particular standards. My students did some excellent work with this–as you can see in the images below. I really needed to add more text details and quotes because they explained and gave examples to the vague statements I had earlier in my writing. Along with the major changes in my piece, I also had quite a few simple mistakes that I didn’t find at first. These things didn’t pop out at me when I reread my paper once I finished, but my group easily helped me fix them to an extent. My mentor text for this paper was Brittany’s college application essay Costco. Brittany’s narrative helped me because it had many examples of how certain events impacted her life, which I wanted to show in my paper. I used her ideas to create my own interpretation of McCandless’ experiences and how his anchors changed his life. I really wanted to start with how I believed anchors affected people, and what types people could have, and later tie it to McCandless’ story. My target standard was focused on craft and structure to determine the meaning of words and phrases, in this particular case the word “anchor” and what it truly means to McCandless and the reader. Overall I am happy with where this paper is now, and the details and adjustments I needed to add. At the end of October, we started working on our semester grade agreement. I wrote about that process here. This semester, I worked to improve my reading and writing ability for me, not anyone else, and definitely not for a grade. As I mentioned before, I have been able to take more risks, and have grown because of it. A specific example of how I did this as a reader was when I chose to read a particularly challenging choice book. I read Missoula, by Jon Krakauer. This book was not only challenging because of the content, but because of the highly-informative style in which it was written. It was often difficult to keep track of who was who, and exactly what everything meant, but I did it because I was interested in learning more about the book’s important topic, and to improve my nonfiction reading skills. An example of how I did this in writing was when I wrote a story about my dog for a weekly draft. I was never very good at narrative writing, but I gave it a shot for that draft. I tried to include as much detail as possible, and really make the story believable and interesting. I had to take risks to do this. If I had been worried about a grade, I probably would’ve chosen a different topic, because that would have been the safer choice. In the last week of the semester, I read and responded to students’ grade letters. In most cases we agreed. But in several cases we didn’t agree. If I saw something different based on the data we had for those students, I pointed them back to that body of data and the grade agreement that we established and in some cases, invited students to do more work. On the whole, I was pleased with the reflective work they did as they wrote their grade letters. I saw evidence of learning, learning that mattered to my students. But I’m plagued with questions. We started with the CCSS but didn’t use them in the grade letters. Shouldn’t the set of learning goals they establish early on line up with the learning goals they are using to evaluate their work at the end? I know how the disconnect happened. I committed this year to use for the grade agreement learning goals that came from the students’ articulation of what seemed the most important work of the class. After several gradeless semesters, I could so easily craft a grade agreement that would be efficient to use in the end and that captures the work that the course asks of students, but the process of having the students do this thinking together is so important toward getting them focused on the learning. Asking my students, “What does this class ask you to learn?” got them started on identifying the learning work of the course. Putting this at the center of the grade agreement process is powerful. if I just handed them a list, they would not have to do that important thinking. So in my quest to get students focused on the learning the class is asking of them and to be able to articulate that work in their own words, the learning goals the students had their hands on most frequently were not the list of the Common Core State Standards that each student selected for him/herself but rather the learning objectives that ended up on the grade agreement. I’ve always worked to make learning goals very clear to students. I did some learning years ago with the assessment work done by Stiggins, and an idea has resonated with me ever since: students can hit learning targets that they can see clearly and that hold still for them. In the past this meant that I wrote clear, specific learning goals for my students. This morphed into me presenting a set of learning goals to my students (like the CCSS) and asking them to identify the ones that are most relevant to them each individually. And now I’ve started working on having students articulate those targets based on the work they have been doing in the class. But what’s the best way to approach this? After 21 years of watching students learn in my classroom, I have a pretty good idea about the work they need to do. The cleanest, simplest path to a set of learning goals would be for me to write the targets myself or hand them a list of pretty good learning targets, like the CCSS that capture what I know my students need to work on. But that puts something besides students at the center. It’s messy to have students articulate the learning goals. And it takes time. But it’s important–critically so I argue. If my goal is to get students evaluating their own learning effectively, they need to know the learning goals well. They need to feel like they own them. What role, then, do the standards and curriculum objectives play if they are not the center of my students’ work to evaluate their own learning? Lately I’ve been thinking that the standards and curriculum objectives are solely my responsibility. It’s my job to plan a classroom experience for students that is based on the required standards and objectives. It’s my job to assess how well my students are meeting those standards and objectives. And if I’ve done my job well, there will be parallels between the required standards and objectives and the list of learning goals my students create together. The work of the classroom should reflect those standards and objectives. But still there is this little worry dancing around in my mind–what about gradebooks that are aligned to the standards? What about putting the standards on the board each day? What about telling students which standards each assignment is helping them to master? Isn’t this all good assessment pedagogy? Yes, that’s what has been explained to me over and over again, but I think that putting everywhere those standards that someone else wrote–someone who doesn’t even know my students–only serves to tell students that they are not the most important actors in their own education. I starting with my standards and required curriculum. I wrote a set of learning objectives for my students based on those required pieces, but that were a little more friendly for me to work with. I planned work my students could do to engage with those learning objectives: course curriculum, semester calendar, weekly routine. I met students and got them working. This included having students look at the Common Core State Standards and select a few for themselves individually and write them in their writer’s notebook (but in hindsight, I think in the future I will approach this step later, once we have the set of learning goals for the grade agreement–see #8 below). This also included having students write reflective memos on their writing to connect to their lists of individual standards. After a few weeks, I asked students, “what is this course asking you to learn?” Together they made a list of learning goals based the conversation we had starting with that question. I examined the list of learning goals students write together to be sure it lined up with the standards and curriculum I started with. I had students choose the most important learning goals (they voted essentially) to become the class semester grade agreement. 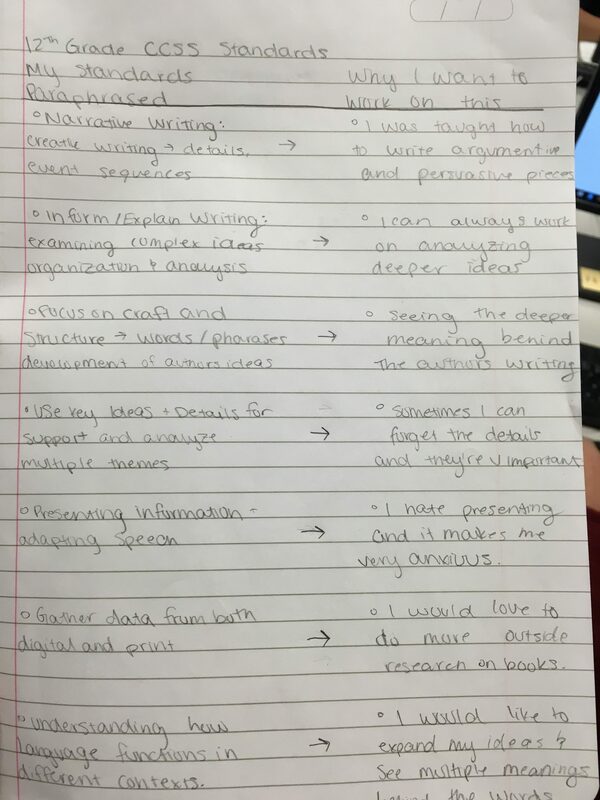 This is not what I did this year but may try in the future: have students each choose a few learning goals that best capture the learning they each need/want to do and ask them to record these in their writer’s notebook and reflect on them frequently (writer’s memos, conference conversations). At semester’s end, have students look over gradebook data, their writer’s memos, and their own work for evidence of their learning and growth to include in their grade letters. How do you use your required standards and curriculum objectives to assess your students’ learning? The other nagging question I have is about how much I know about my students’ learning. What evidence do I have that my students are learning? How clear is that evidence to everyone involved? If a grade should indicate to people how much students have learned, how well do the semester grades that end up in my gradebook accomplish this? And what should a grade indicate anyhow? I know that my points-based gradebooks of the past didn’t say much about my students as learners. My qualitative warehouse approach to my gradebook now tells me much more about my students as learners. But am I missing out on something important by not quantifying learning somehow, with numbers? I know the numbers in my gradebooks in the past didn’t really quantify learning, so I shouldn’t be so worried about this. Those numbers told me more about my students’ ability to comply and collect points than they told me about how they grew as readers and writers. But the primacy of the number is so strong in our collective consciousness, so I worry. Those numbers when they are “grades” communicate all kinds of things to our students about who they think the world thinks they are, and who they think the world says they need to be. According to the set of expectations students carry with them in their minds–reinforced repeatedly by the college application process, by car insurance good grade discounts, by things teachers and parents say to students about why good grades are important–if the number is over 90, you’re just fine. Below 80, something’s wrong with you. Our current online gradebooks that allow students to track that number as we enter test scores and grades makes every single data point high stakes for them. My students can set the mobile app for our required gradebook to ping them anytime a teacher updates anything. But still, am I missing anything by only quantifying how much of the work my students have completed that the class has asked of them? Numbers do help us to see growth quickly and efficiently–that’s if they are actually meaningfully measuring growth. But there’s really no quick or efficient way to make sense of students as they grow as readers and writers and thinkers and human beings. I just want them to work genuinely in my classroom, and to think about themselves as learners, and to focus on the reading, the writing, and to see where they’ve grown and improved, and to take risks and fail and get stronger because of it, and to dive in to make the work as meaningful as they can for themselves. I want them to do all of this free from the pressure and consequences of a grade that could drop at any time if they mess something up. Thanks for reading if you’re still with me. Writing this has helped me to figure out a few things, including what I’m looking for as I read the book I mentioned at the start of this post. I’d love to know what reading this brought to mind for you? Anything you can help me with? This is the sixteenth post in a series about not grading in the high school language arts classroom. This entry was posted in #StopGrading, 21st century teaching and learning, assessment, blog series, fall 2016 blog series, gradebook, grading, making change, not grading. Bookmark the permalink. I’m so glad I found your blog – what a treasure trove of thinking and practical resources – thank you!!! We have just begun some departmental conversations in our middle school about stopping the grading of individual writing pieces, but clearly there is so much for us to consider. I so appreciate your tips and examples for hacking IC since that is one of our most formidable obstacles. We also have to give a number (1-100) grade at the end of each quarter, which is so problematic. Anyway, thank you for sharing your thinking. Hi Christina–thanks for reading! Keep us posted on how it goes and what you figure out along the way.